Red H&M Pants first appeared on Chictopia's streetstyle gallery in Fall 2010 seen on New York blogger itsnotthatdeep of itsnotthatdeep.com. She styled her red H&M pants with a camel thrifted sweater and tawny H&M shoes. Since then, Red H&M Pants have grown in popularity as bloggers from New York, New York, and San Diego have discovered them. Red H&M Pants are generally seen in chic, casual, and trendy style. Popular types of Red H&M Pants are colored, skinny jeans, leather look, cropped, and skinny. 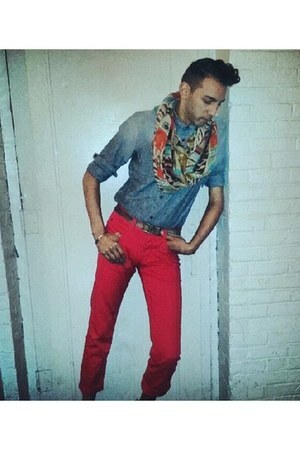 There are currently 122 streetstyle photos of bloggers wearing Red H&M Pants. 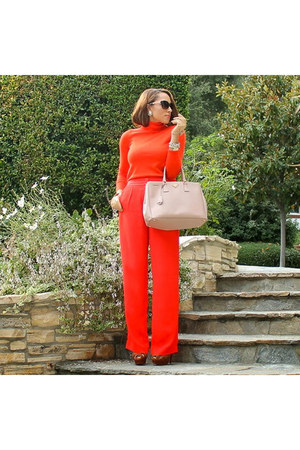 Most recently, blogger queenhorsfall wore her red H&M pants in a streetstyle look. It's my pleasure to review these very chic leopard culottes from H&M that have just the right amount of edge yet are very classy and stylish. They fit true to size with a little room to breath as they flare out over the hips -- great online find!